You might think it is too good to be true: Before your event, your attendees are already virtually connected and start interacting with one another through an event app. 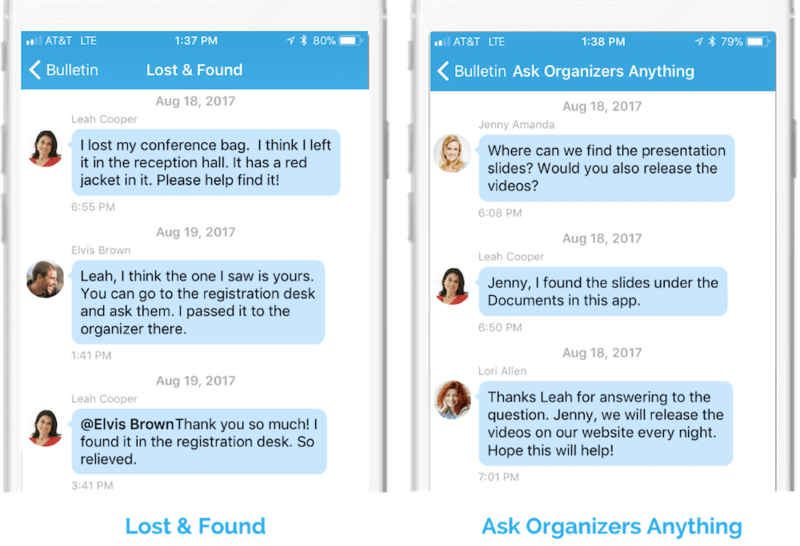 While you are running around to handle logistics at an event, you feel relieved knowing your attendees already answered to others’ questions (for example: wi-fi password) and helped each other on lost items. You see that they actively participate in activities and conversations, share information about local attractions, schedule a carpool, chat about a dinner gathering, and share exciting photos. And all this happens without needing your great efforts! This is actually a real story from many events that made a good use of the Community Board on the Whova event app. It has become organizers’ and attendees’ favorite tool! Organizers could know how attendees were enjoying the event and directly engage them in an organic way. 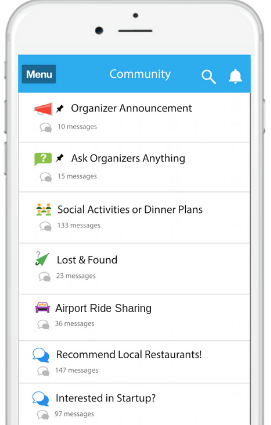 Your attendees no longer have to panic when they lose their belongings and find you to ask for help! They can make a post on the Community Board and other attendees can help find the item. While yourself don’t have to make an announcement each time, you can help them faster by providing a good communication channel. There is a built-in thread called “ask anything to organizers”. Attendees can post questions about a wi-fi password, shuttle services, presentation slides, etc., so you can help make their event experiences smoother. In many events, even before organizers answered to their questions, other attendees posted the answers, saving organizers time! It is a good place where attendees and organizers directly interact with each other different from announcements. It’s very convenient for attendees who are unfamiliar with the area to schedule a ride share from an airport to an event venue. It can be a perfect opportunity to have a small talk and get connected even before an event begins. Attendees would feel they are being taken care of from the beginning and have a good impression on your event. 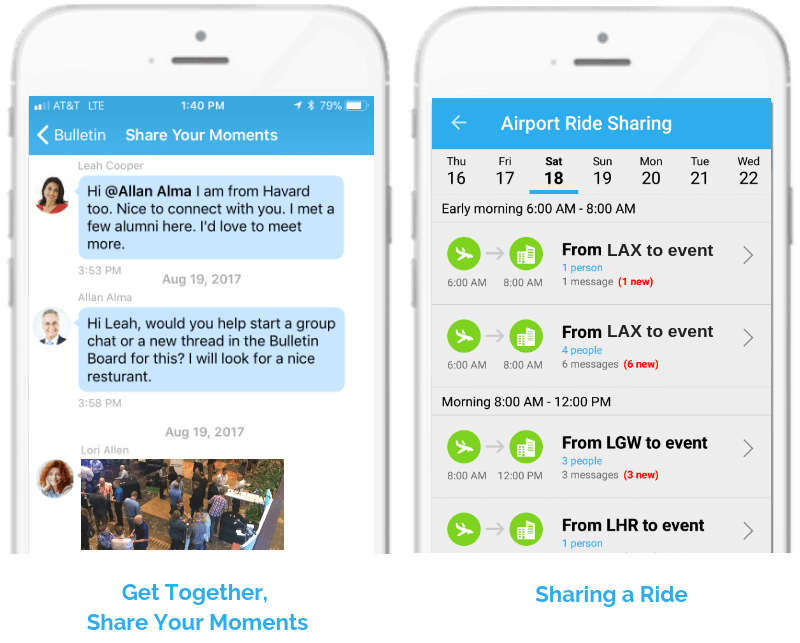 See how attendees utilized the Ridesharing feature. Not many events offer a dinner and it is actually good chance for attendees to explore local restaurants and hangout with fellow attendees. They can share recommendations of places and invite people through the Community Board. Did you forget to provide information of local attractions to your attendees? Don’t worry, you can do it at any time through the Community Board. Many attendees create topics by themselves to get together with former colleagues or alumni. People with the same interests or specialty can be connected through the Community Board and stay in touch even after an event. Let your attendees create opportunities to connect with people and get most of your event! At any type of event, there’s always attendees who are interested in new career opportunities. Some may look for business partners or candidates to hire. The Community Board is a good place for your vendors, sponsors, exhibitors, and attendees to share information of job openings or collaboration opportunities. Both organizers and attendees can create custom topics while there are some built-in topics including “Lost & Found”, “Share your moments”, “Ask organizers anything”, etc. You can boost attendee interactions, drive event-specific discussions, and create a sense of belonging. Some real examples are “Local Restaurants & Attractions”, “Share Tips for First-Timers”, “Resources Everyone Should Know About”, “Tech Subgroup Meeting”, etc. The Community Board has been a great hit at many events. It increased attendee participation, interaction, and engagement. If community building is one of your event’s goal, it is one of the key features that you and your attendees would love. Want more details? Request more information now. 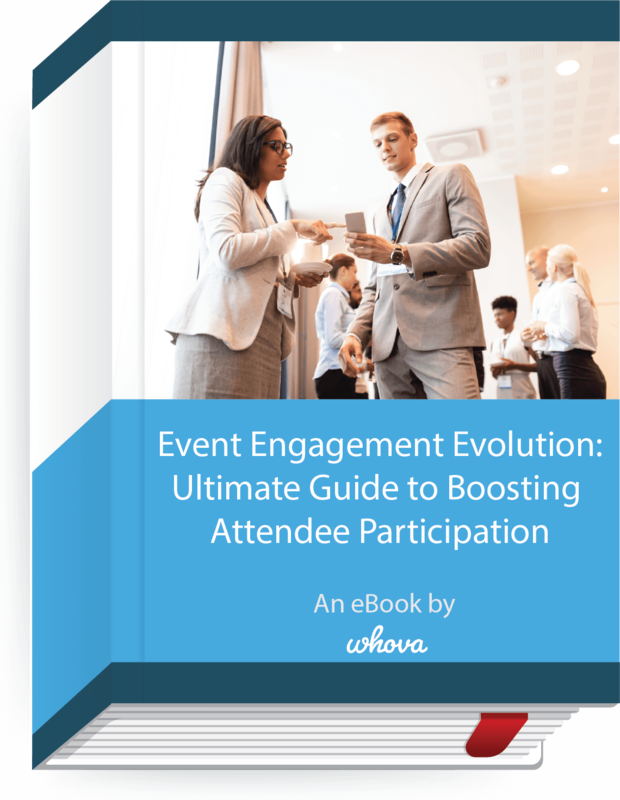 This e-book provides you a step-by-step timeline guide to create an engaging event, recent event tech trends, real examples, and many useful tips and templates.